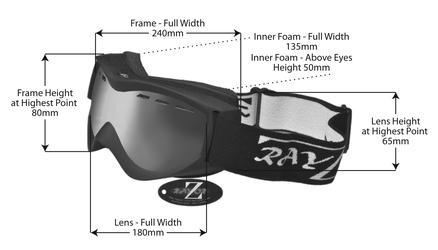 Home Snowboard & Ski Goggles RayZor Black Framed Goggles With an Anti Fog Blue Iridium Mirrored Vented Double Lens. UV400 Blue Iridium Mirrored Anti Glare, Vented Spherical, Wide Vision Clarity Lens. The RayZor Blue Iridium Mirrored Sports Lens is the True Sports Lens Offering Color Enhancement to Offer Clearer Visibility. I got these as a spare for my expensive addidas yoda goggles. The Razor specialise in bright light so good for sunny weather. I have used them on a recent skiing trip and heartily recommend them. The lenses were sharp with no visual distortion and had very good tint. They worked well with my giro helmet and didn't steam up at all on very warm day. They were quite comfortable on the face.Not as good as the Adidas but given the price difference is little unfair to criticize. I think that they a great ,cool looking goggle and worth every penny. These were great on a sunny skiing holiday over Christmas. The lenses kept out the sun's glare and provided high contrast between the snow and the sky. I have had several ski googles over the years and these are the best. Good price too.